As I said before, my grandfather from mother's side was Johann Friedrich Daniel Herwich, born on or about 1750 at Massenhausen Germany (and died 1810 Semarang); he started his carreer as a "Chirurgijn" employed by the Dutch V.O.C. (Vereenigde OostIndische Compagnie), landed at South Africa, executed his job for a couple of years overthere (* South African Historian Library), met his future wife Johanna Willemina Isaaksz and moved to the former Dutch East Indies and settled down at Semarang, where my mother Jacoba Helena Herwich was born in 1796. My mother had one brother Theodor Herwich (1803-1834) and one sister Petronella Elisabeth Herwich (??-1888). Uncle Theodor had one son called Heinrich Theodor and he became a Medical Doctor too in 1858 and sadly died on 7 July 1859 due to an illness at age of 28 years. My aunty Petronella married a V.O.C. employee from Ceylon (Sri Lanka) and died in 1888 at old age. (*Dutch National Archives and newspapers). This young man became my father and he was born in 1778 at Borvar (Buvari) Iran nearby Teheran, was sent by his father to Calcutta to the Armenian School and started his career to become a respectable and honorable Kojakh ( Wholeseller - Trader). In 1812 my father's first child and son was born and was called David, out of a relationship with a local Indonesian woman and most probably in this very same year, my father met my mother and they married in 1813 at Semarang. My half-brother David died 1835, 2 weeks before our father died.... My half-brother David became captain of one of my father's ships and died, most probably by an illness or maybe by a ship's accident. The reason was not noted in the archives. His marriage with Gulhelmina Charlotte Vincent lasted less then 1 year and had no children. Frederik Daniel (1816-1874). He married Catharina Elisabeth Manuel. Frederik Daniel became a landowner, following our father's steps and joinventured his business with his cousin Carapiet Andreas and Carapiet Minas Johannes. Johanna (1817-1856). She married Charles Francois Boudriot. He was a Resident (=Governor). Cornelis Hendrik (1818-1853). He remained unmarried and went into business. Jacobus (1820-1901). He remained unmarried and went to Europe and returned at Semarang somewhere in the late 1890's. He claimed his heritage in 1869 and consumed it all and died in the Semarang hospital in 1901 in poverty. Geertruida Hermina (1822-1913). She married Johan Willem Christiaan van Langen, widower of her sister Wilhelmina Carolina who died at young age. He was a military officer and originates from the Dutch Nobility. Jan Joseph (1823-1869). He married Anna Jacoba van den Worm. Anna, yes that is me. (1831-1894). I married Tiemen Cornelis Johannes Kroesen, "Hoofdintendant" Colonel of the Netherlands Indies Army and we had 4 children. My husband was the younger brother of General Willem Egbert Kroesen. Louise Elisabeth (1834-1867). She married Pieter Matthijs van Laren. He was a Governor and originating from the Dutch Nobility. Go to My Family Part 2. The Death of my father. 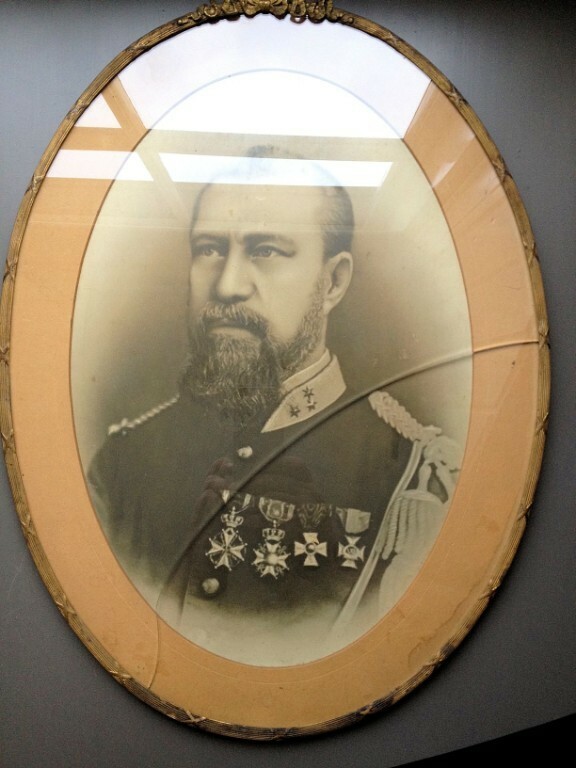 My husband Tiemen Cornelis Johannes Kroesen - "Hoofdintendant" Colonel of the NIL Army. Director BOW Services Dutch Colonial Administration Jakarta. President Chairman of the Dutch Colonial Disaster Funds Jakarta. Significant detail: Son of General Willem Egbert Kroesen was Cornelis Alexander Kroesen, Governor of North Sumatra (Aceh) and personal friend of the rebellion leader Teuku Umar. This friendship was against the will of his father and Cornelis Alexander Kroesen was "silently" moved as his friendship with the rebellion leader was inconvenient to the colonial ruling system and became governor of South Esta Kalimantan and Celebes, about a coupe of 1000 kms' away from North Sumatra. Cornelis Alexander was born at full sea when his parents were on their way to Dutch Indies. By "promoting" his son to a far away area, his father General Willem Egbert Kroesen was not anymore bothered by his son's friendship with the rebellion leader who in fact was the enemy and could continue his wars against the Acenese. Cornelis Alexander Kroesen was a lover of nature and some of his books are preserved at the National English Botanical Library. He was a straight thinking person and was averse of corruption. He even did not fear to arraign his own brother to the court of justice because of corruption. Remember: ALL contents is copyright www.imexbo.nl , www.imexbo.eu . www.annajohannes.eu , www.amirkhanian.nl , www.imexbo.org the family Amirkhanian at New Julfa Isfahan Iran , the webmaster and owners of all said mentioned sites. You have no rights to copy unauthorized prior to permission.